The 29th was part of the 313rd Troop Carrier Group. It has also taken part in the airborne drop in the night prior to the allied invasion in Normandy. September 17; The 29th was determined to make this a perfect drop. At the briefing a paratrooper had a speech telling the men he didn't care if they dropped them in heaven or in hell, as long as they dropped them together. 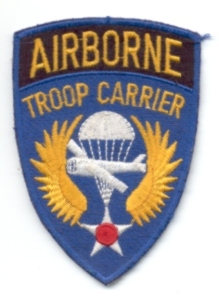 The squadron was sheduled to drop paratroopers of the 82nd Airborne division near Nijmegen. Weather was good and along the way they could see Dutch civilians on roof tops waving at them. Typhoons, Mustangs and Spitfires dove with blazing guns on suspected gun positions along the way. Since it was a daylight jump theu could see the flak much better than on the other missions which wasn't a great site. The 29th squadron did not loose a single aircraft on the first day of the operation but the men did see several aircrafts of the other squadrons go down around them. September 18; On the second day the 29th was scheduled to land gliders carrying the 82nd Airborne division on Landing Zone N. The drop was scheduled for 1900 hours. The gliders carried infantry, anti tank guns and a medical unit. Right before take-off from Folkingham the squadron is notified that due to deteriorating weather conditions they will take the northern route in stead of the scheduled southern route. This means that they will cross the coast over Holland and will fly most of the way over enemy held territory. Right after take of the aircrafts flew into fog. In spite of the fog the twenty aircrafts of the squadron managed to cut their gliders loose over the drop zone and returned safely. September 19; The squadron is scheduled to bring the gliders carrying the 325th Glider Infantry Regiment to the landing zone south of Groesbeek. Due to the fog the mission is postponed twenty-four hours. September 23; The 325th can finaly fly into Holland with it's gliders. The squadron flies along the adjusted southern route so that it can fly most of the way over friendly territory. The squadron has to cut the gliders loose over landingzone O, 1 mile northeast of Overasselt. This landingzone had more fences and small hedgerows as landingzone N but it was out of reach for the German guns and firmly in the hands of the paratroopers of the 82nd Airborne division. Due to a misunderstanding between a C47 and a gliderpilot onf of the gliders is released short of the landingzone. This causes a chainreaction in the squadron. Nineteen gliders land twelve miles short of their landing zone. Luckily they land near the main highway (hells highway) and with the help from Dutch civilians they are on their way towards the right landing zone shortly after landing. The story above is a small summary. No pictures of the 29th Squadron are available yet.